Incredible resolution perfect for the high-megapixel era. Introducing the new benchmark large-aperture standard lens. this refined lens perfectly represents the ideals of our Art line. Top optical performance makes it the ultimate go-to lens.An icon of SIGMA quality, this is the ideal standard lens. SIGMA was the first lens manufacturer to introduce a 50mm F1.4 lens. Now, to create the ultimate go-to lens, we took optical performance and image quality to the limit. The result is a true icon of SIGMA quality. Fulfilling the concept of our Art line at the highest level, the 50mm F1.4 DG HSM is a large-aperture standard lens that delivers top performance. Its outstanding resolution makes it ideal for the high-megapixel era. It delivers exquisitely balanced images with a beautiful bokeh effect, setting a new benchmark for large-aperture standard lenses. It is the ultimate expression of the 50mm F1.4 specification, known to bring out the photographer’s unique personality and approach. Once you own it, you’ll never want to be without it! Designed with a focus on sophisticated optical performance and tremendous expressive power, our new Art line of lenses delivers top-level image quality. With unsurpassed expressive performance, these lenses reach the high standards demanded by photographers with an artistic, creative inclination. Along with landscapes, portraits, still-life, close-up and casual snaps, they're perfect for the kind of photography that unleashes the inner artist. Ideal for studio photography, they offer just as much expressive scope when capturing architecture, starry skies, underwater shots and many other scenes. The full realization of the Art concept, the 50mm F1.4 DG HSM is the perfect flagship. Hold it in your own hands and appreciate it with your own eyes. we’ve minimized optical aberrations and achieved the very highest level of optical performance. A 50mm F1.4 large-aperture lens offers an angle of view similar to human vision, a beautiful bokeh effect, and expressive versatility. It’s a basic specification that lets photographers take many different approaches to their craft. For this very reason, it demands a high level of fundamental performance. SIGMA has designed lenses especially for digital SLRs since they first appeared on the market. In 2008, we first introduced the SIGMA 50mm F1.4 EX DG HSM. Although compared to the lenses of today it had a fairly large body, this lens offered uncompromising performance and embodied our ideal of the standard lens. Until this time, only camera manufacturers had produced a lens in this specification for DSLRs. Our version of this go-to lens created quite the stir at first. Earning the support of photographers with its exceptional performance, it has become one of our representative lenses. 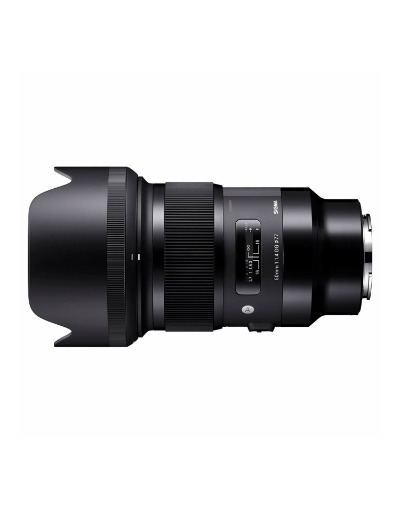 The SIGMA F1.4 DG HSM fulfills our design concept and quality requirements at the highest level. While producing a beautiful bokeh effect, it features exceptional peripheral brightness and minimal distortion. Uncompromising in every detail, this large-aperture standard lens offers the ultimate in image quality. Its high resolution makes it perfect for the high-megapixel era. Resolution is extremely crisp at the area in focus, while both front and rear bokeh are silky-smooth. Offering the ultra-high performance that characterizes our Art line, this lens inherits the design principles of the line’s first model, the flagship SIGMA 50mm F1.4 DG HSM. While maximizing resolution at the area in focus, this lens offers a silky-smooth bokeh affect to the front and rear. To achieve exceptionally crisp resolution, we have minimized sagittal coma flare, chromatic aberration, and every other type of optical aberration that affects image quality. 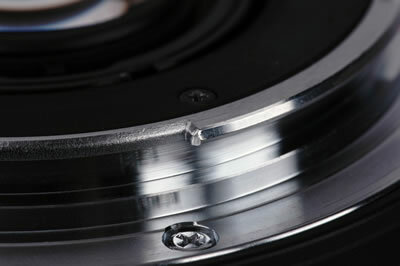 The result is minute detail without bleeding or streaking, even at wide-open aperture. Moreover, we have also minimized both vignetting and color streaking to the front and rear of the area in focus, thereby establishing a bokeh effect that is natural and aesthetically pleasing. Axial chromatic aberration is difficult to correct after a photograph is taken using image processing software. For this reason, this lens features SLD (Special Low Dispersion) glass to minimize axial chromatic aberration and deliver sharp, high-contrast image quality throughout the frame. 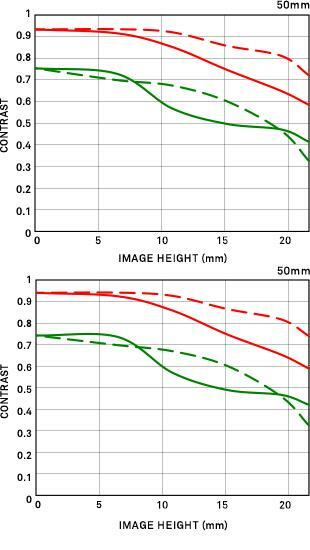 An ideal large-aperture standard lens offers outstanding image quality across the image plane, even at wide-open aperture. Sagittal coma flare is an optical aberration in which point light sources near the image periphery have a tail (“coma”) instead of appearing round. To minimize this aberration, we have included a precision-molded aspheric lens element in the rearmost lens group. Since it minimizes the streaking of point light sources near the edge of the image, this lens is an excellent choice for shooting heavenly bodies and nighttime illumination. In addition, its beautiful bokeh effect makes it a great go-to lens for portraits, interior shots, and many other applications. 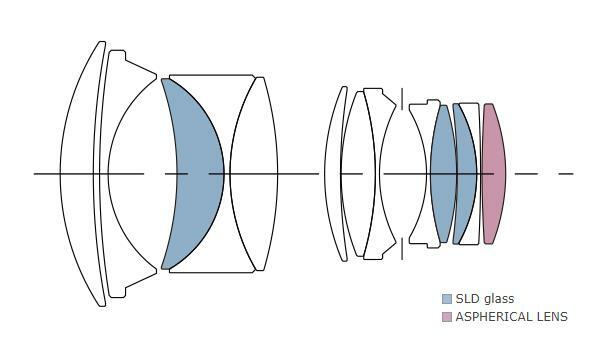 Large-aperture lenses are prone to reduced peripheral brightness. 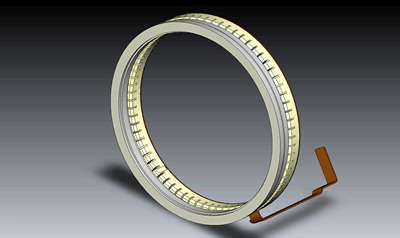 In this lens, we have made the forward lens group large-aperture, thereby raising aperture efficiency. 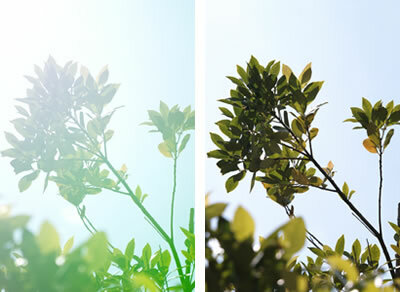 The result is minimal reduction of brightness at the image periphery and even image quality throughout the photograph. Even at the wide-open aperture, you can shoot a blue sky without fear of reduced brightness and achieve a beautiful bokeh effect at the same time. 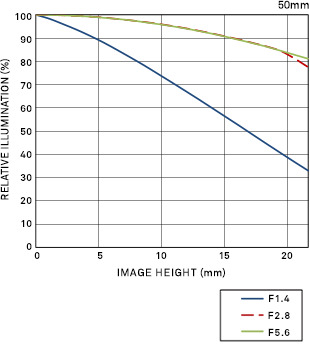 The x-axis represents image height (distance from center of image in mm), and the y-axis represents the relative illumination at the edge of the image (with illumination at the center of the image defined as 100%). When relative illumination is low, the corners of the image appear dark, resulting in vignetting. Distortion is an optical aberration in which straight lines appear bent or curved. Since adjusting the focus cannot correct this aberration, it must be minimized at the design stage. This lens features aspheric lens elements and an optimized power distribution to minimize distortion from the center of the frame all the way to the edges. Superior functionality across the lineup, thanks to SIGMA’s proprietary new A1 MTF measuring system. The 46 effective megapixel (4,800 × 3,200 × 3 layers) and 44 recording megapixel (4,704 × 3,136 × 3 layers) 23.5 × 15.7mm APS-C X3 direct image sensor captures all primary RGB colors at each and every pixel location, ensuring the capture of full and complete color. Using three silicon-embedded layers of photo detectors, stacked vertically to take advantage of silicon's ability to absorb red, green and blue light at different respective depths, it efficiently reproduces color more accurately, and offers sharper resolution, pixel for pixel, than any conventional image sensor. 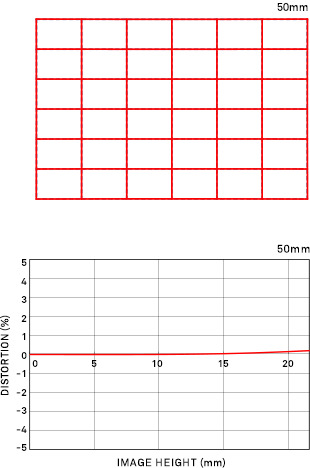 Since color moiré is not generated, the use of a low-pass filter is not required, meaning light and color, generate d by the 46-megapixel APS-C X3 direct image sensor is captured with a three-dimensional feel. All lenses in SIGMA’s new Art line come with a hood with a high-quality rubberized connector and feature a newly designed lens cap and AF/MF switch, and are designed for intuitive use and superior functionality. Inside, HSM (Hyper Sonic Motor) delivers high AF speed and extremely quiet performance. An enhanced algorithm offers even smoother automatic focusing. Full-time manual focus override is another key feature that leaves the artistic touches in the photographer’s hands. The brass mount combines high precision with rugged construction. Its treated surfaces and enhanced strength contribute to the exceptional durability of the lens. In both the external and internal parts, the optimized use of TSC (Thermally Stable Composite), an excellent match for metal parts, further contributes to the high-precision construction of the lens. In addition, the last three digits of the year the lens was offered for sale are engraved on the barrel for ease of reference. HSM (Hyper Sonic Motor) delivers high AF speed and extremely quiet performance. An enhanced algorithm offers even smoother automatic focusing. Optimizing AF algorithm, smoother AF is achieved. 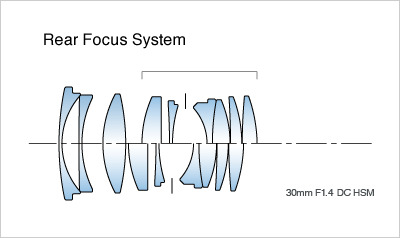 Also, new firmware offers full-time MF function by rotating the focus ring of the lens while auto focusing. 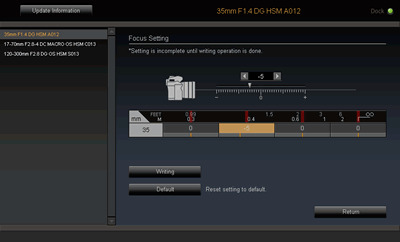 Without changing the AF/MF Focus Mode Switch, it allows faster focus adjustment. * The default setting of Full-time MF function varies for each mount. SIGMA’s floating system adjusts the distance between lens groups during focusing, thereby reducing the amount of lens movement required. The result is less aberration at different shooting distances. Thanks to this system, this lens offers a minimum focusing distance of just 40 cm, a maximum magnification ratio of 1:5.6, and superb image quality at every shooting distance. For our new product lines, we have developed exclusive SIGMA Optimization Pro software that allows the user to update the lens firmware and adjust the focus position and other parameters. 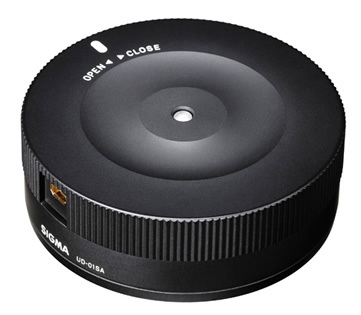 By attaching this lens to a SIGMA USB DOCK, which is connected to a computer, the dedicated software “SIGMA Optimization Pro” offers various types of customization and adjustment such as firmware update, focus adjustment, full-time MF mode change and full-time MF opertaion timing customization. Weight 815g / 28.7 oz.